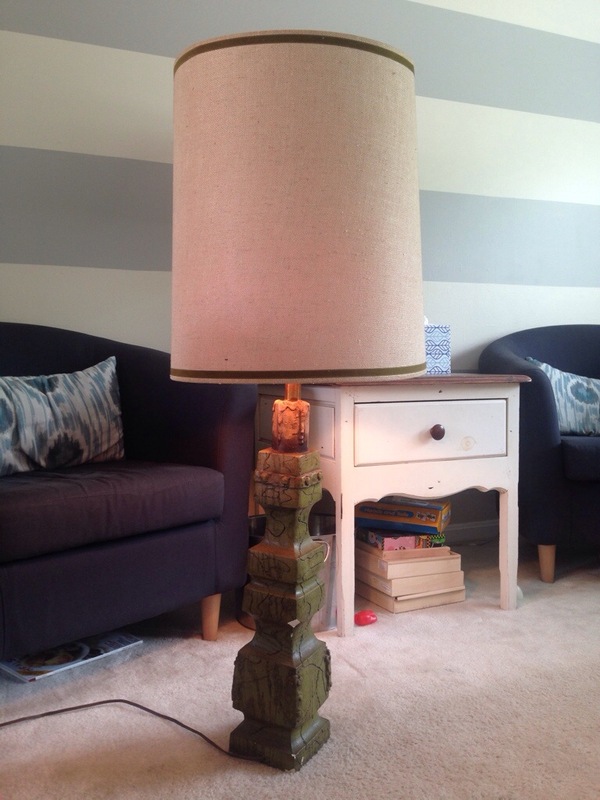 I don’t know how, but I completely spaced on posting an update on my funky $5 lamp that I brought home from a trip to Bluebird Market ages ago. 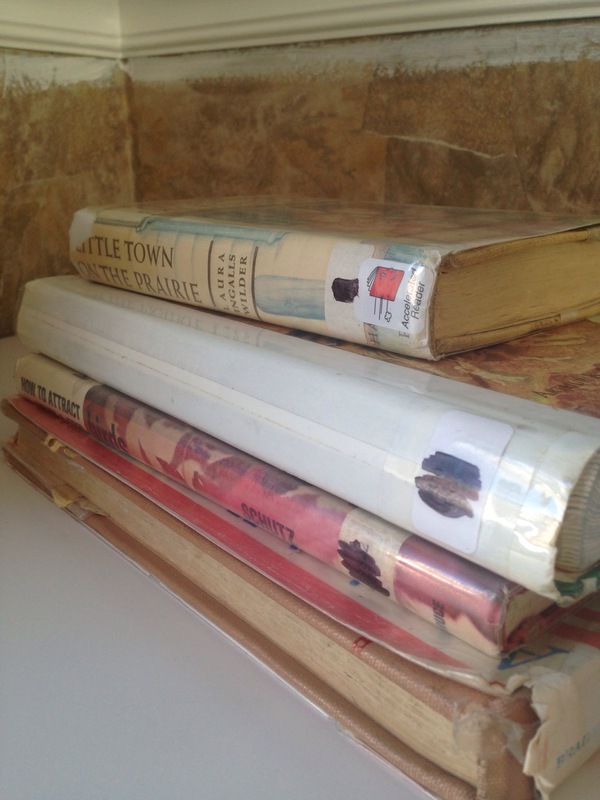 You can see all about my trip and my haul in my post “A Little Birdie Told Me”. I fell in love with this lamp’s unique shape and unusual size. The detail is a funny aged faux wood grain effect. Um, or that’s just the best way I can describe it. 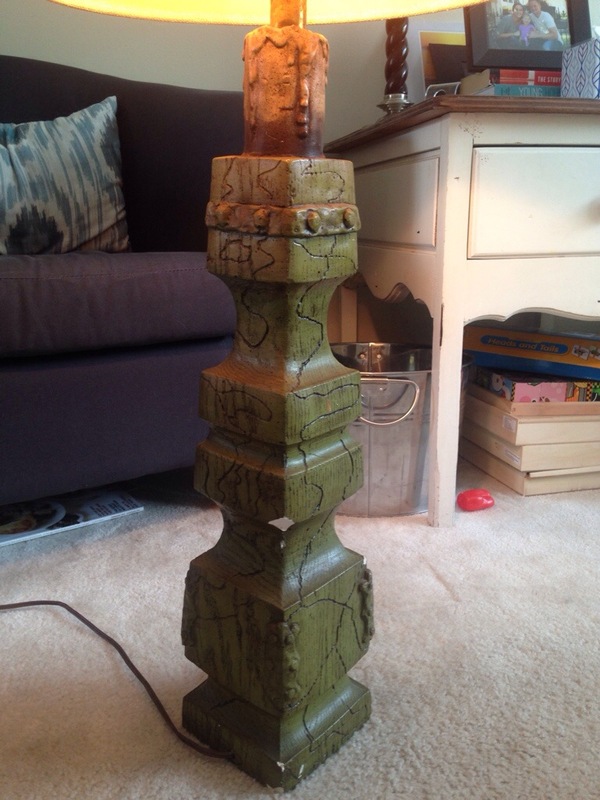 For a couple of months it sat on an end table in my living room and remained what I dubbed “Scooby Doo” green. Yikes! 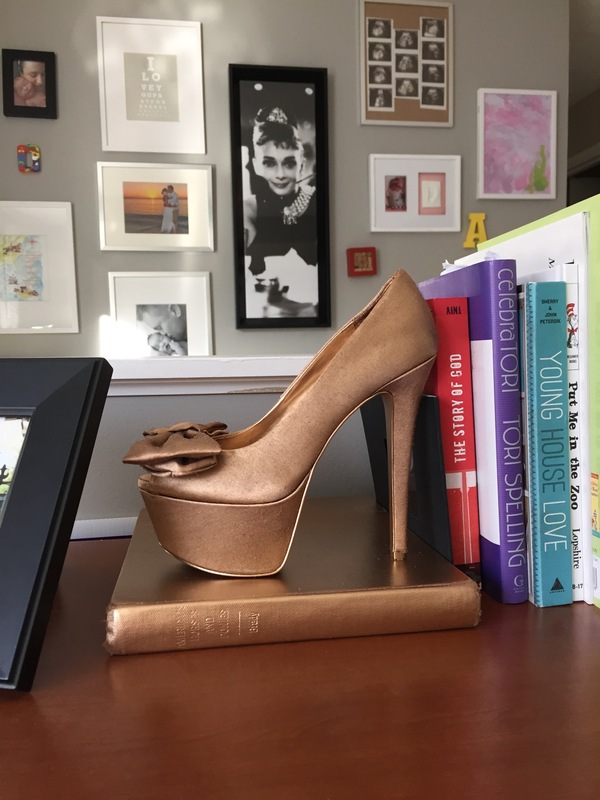 I grabbed a can of gold pray paint at the hardware store for my ridiculous high heel shoe bookends when I realized that this lamp is just begging for some gold paint. 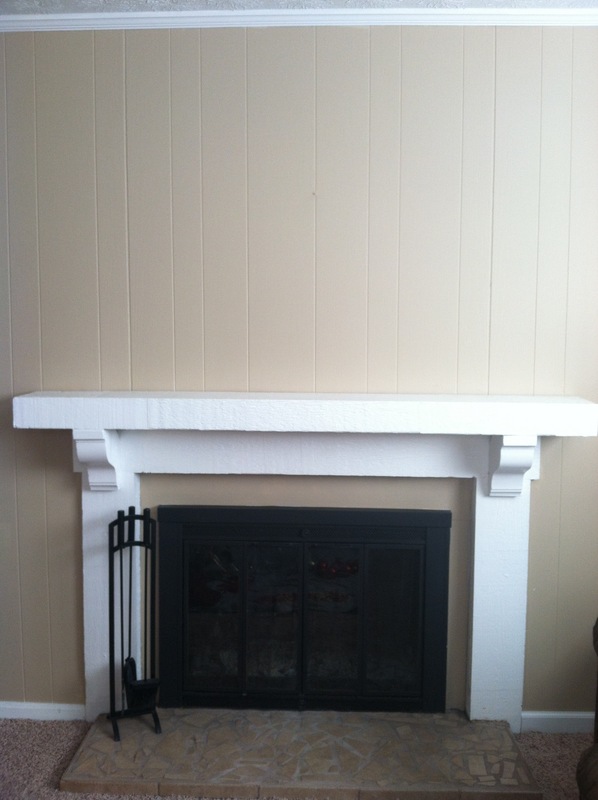 I primed it and painted it right along side the bookends… one can was more than enough for both. Quick pointers for painting a lamp: Use painter’s tape and a plastic bag to cover/seal off the light socket portion and cover the power cord too. I had originally planned to use the over-sized shade that it came with. I even when through the trouble of repairing the seam of the shade. In the end, practicality won out and I got a more petite (10″) cream drum shade from Target. The original shade was made of a thick woven fabric and didn’t let off as much light. The cream shade is more modern and is thinner and therefore brighter when lit. I feel like this lamp has a glam art-deco thing going for it now. A coat of paint can transform anything. O wanted in on the fun. Note her cow girl pajamas. 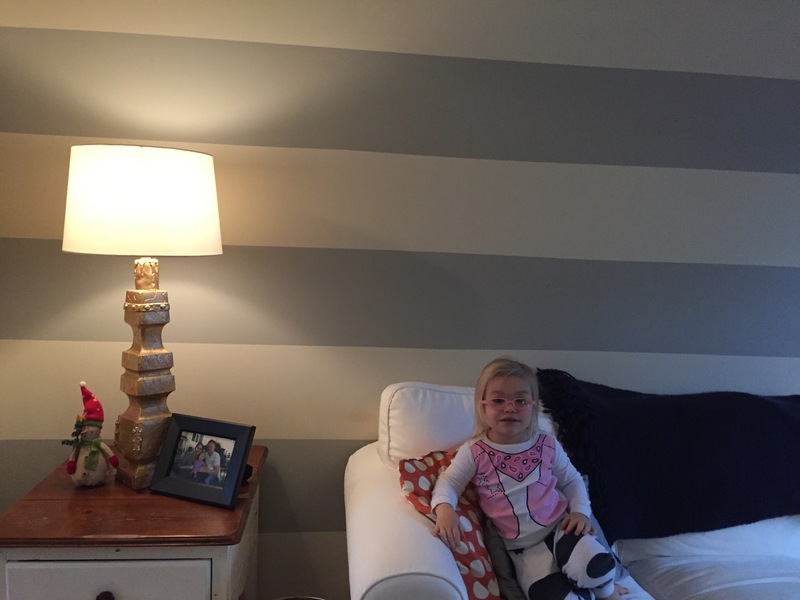 This kid is obsessed with horses, ponies, cowboy boots and even asked Santa for a pony. I have always been a fan of all thing “quirky”. When I was younger I tried to incorporate quirky things into our home decor by failed and instead our vibe screamed “funky”. It’s a hard element to blend into the rest of the house. And as time has gone on, we’ve realized we are more “quirky-chic” than “quirky-funky”. And there is nothing wrong with a little funk, but its not us. Hubby is more subdued (hence the cooler colors and softer materials we use) and I’m not afraid of much (like that awesome Ikea fabric I brought home on a whim). I discovered Jonathan Alder a few years ago and realized he seemed to marry our styles pretty fluidly. What’s not to love? It’s quirky and fun without being silly. But its neutral and classy without being too stuffy. His entire collection is genius! 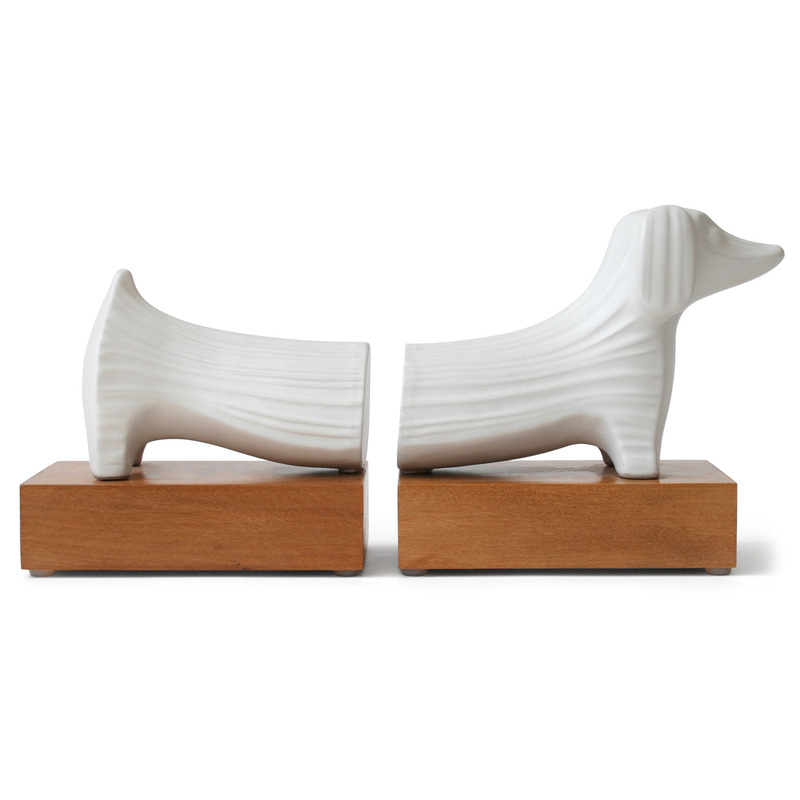 The catch: $150 bookends aren’t in my budget. 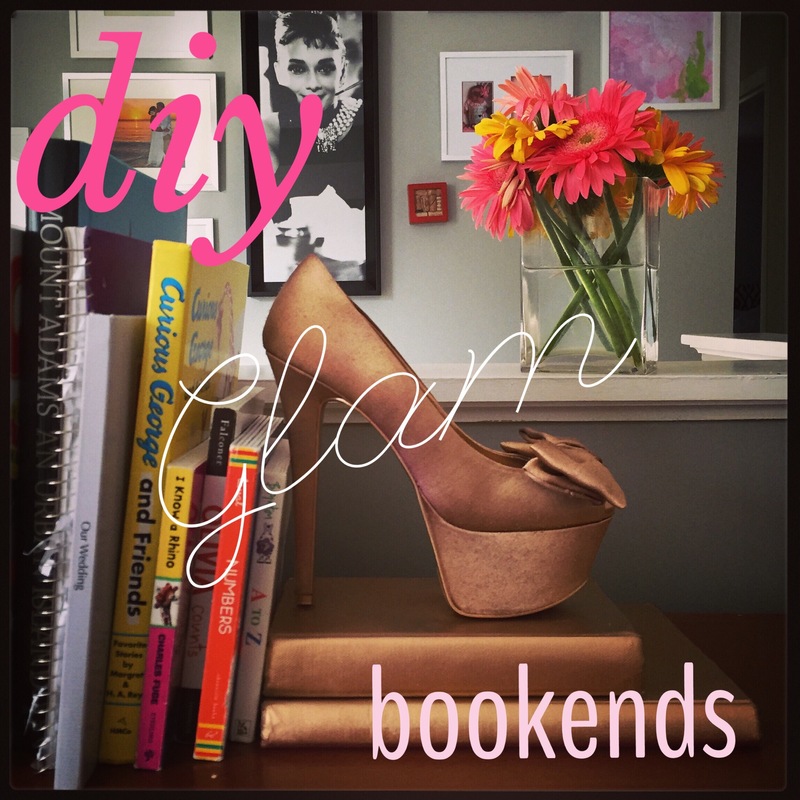 So I got to thinking about how to incorporate something like this into our bookshelves. 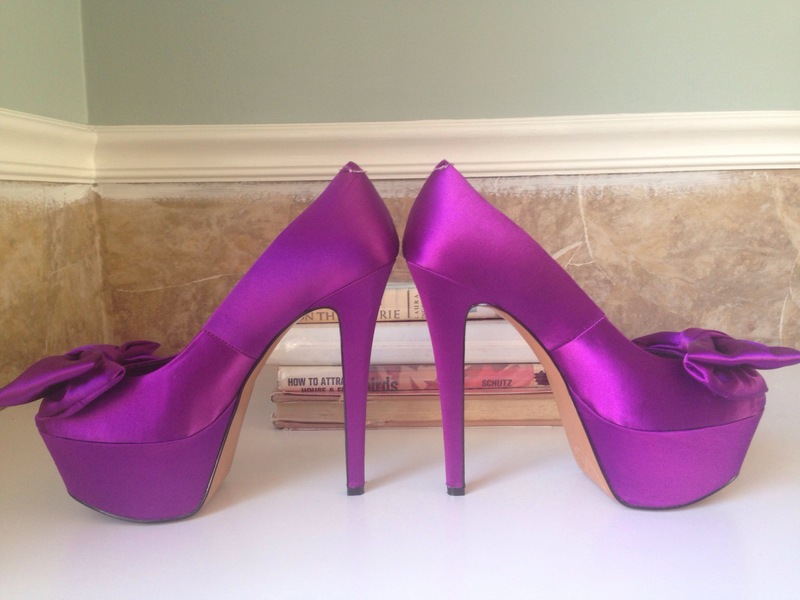 Coincidentally, my sister had a pair of bridesmaid shoes she just didn’t know what to do with. 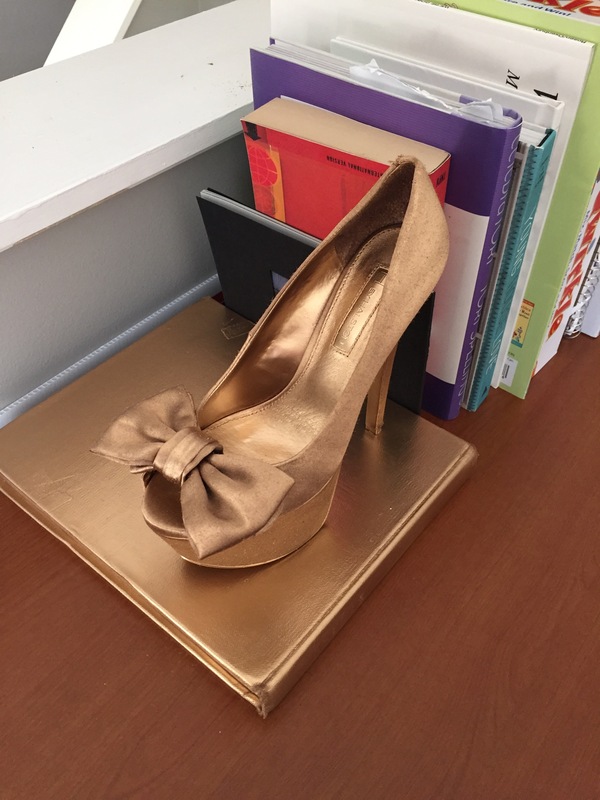 And these are some amazing shoes… she just truly didn’t know where she’d every wear them again. Check these bad boys out! I knew these were the twist of fun inspiration I had been looking for. 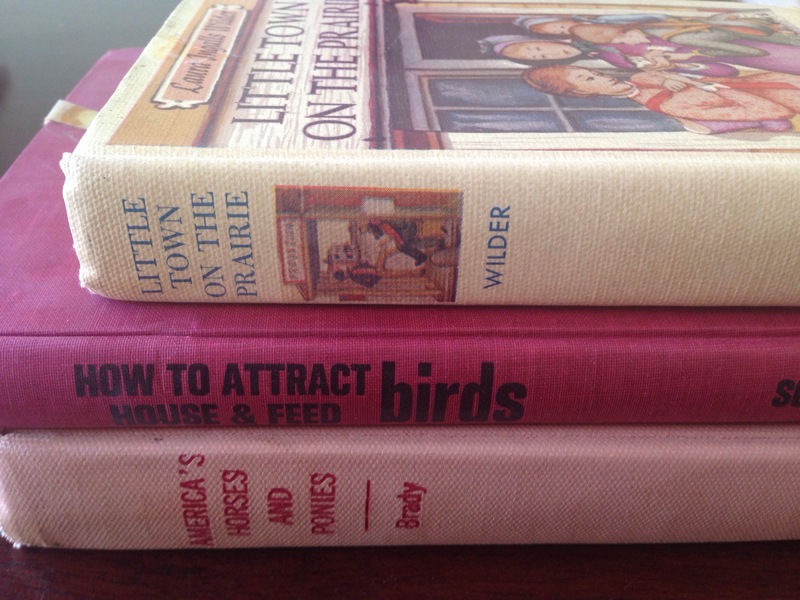 So I gathered some old yard sale books that I had purchased because I liked the shapes and sizes. I seriously never even noticed the titles. 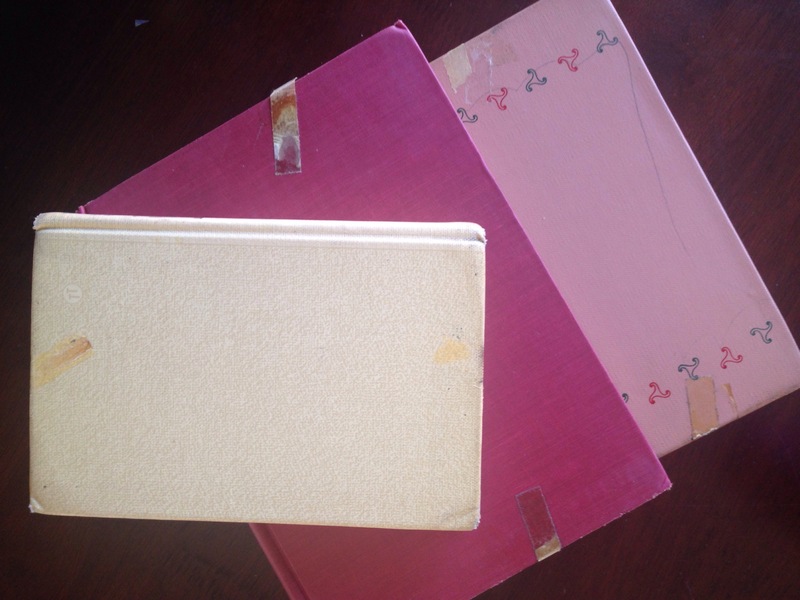 I took the dust jackets off of the books to reveal some cool linen like textures that I remember of library books from elementary school. You can see some of the shapes, sizes and textures in the photo below. 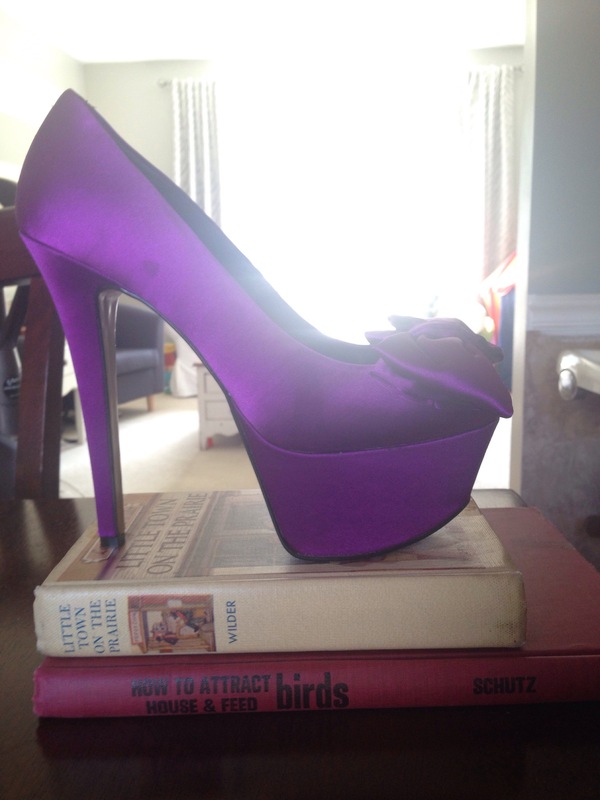 All I had to do was play with the arrangements of books and shoes. 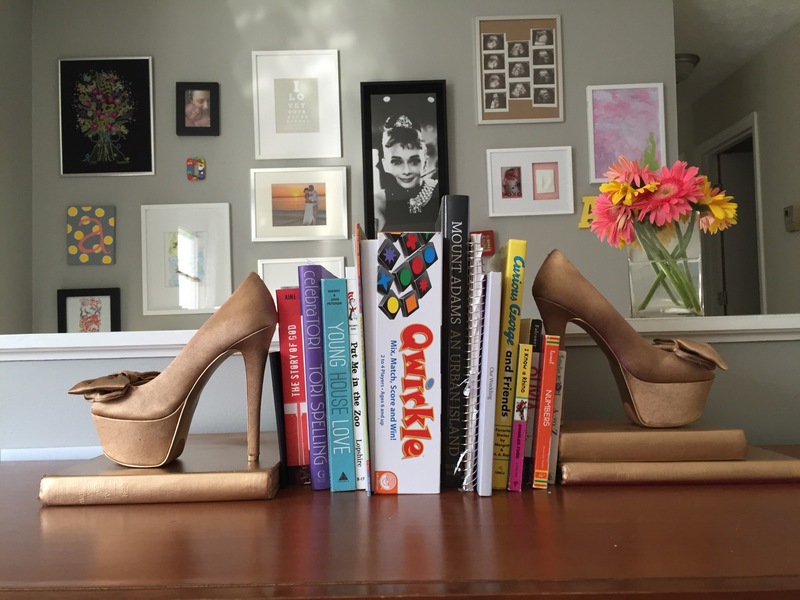 I made sure the binding of the books and the heels of the shoes worked so that as bookends they could face away from each other with the heels toward the books and binding facing out. I used super glue but hot glue or E6000 glue would do the trick. 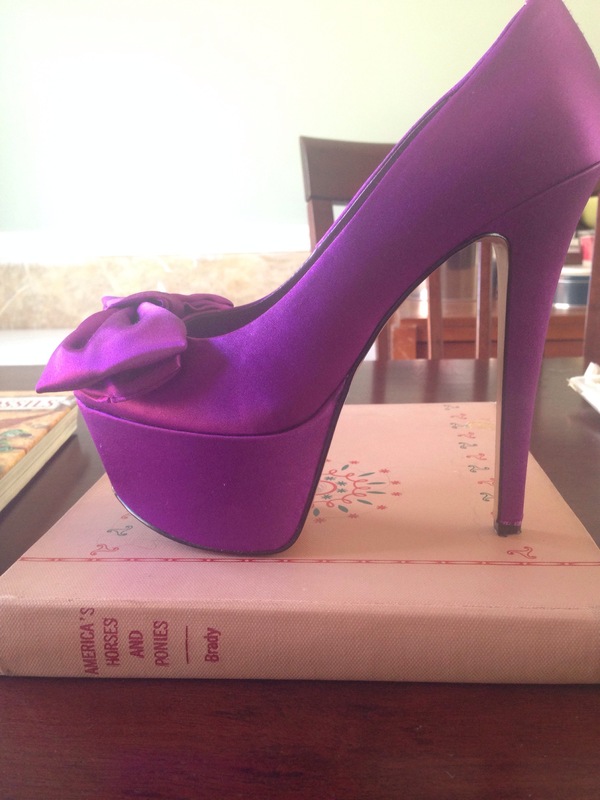 So above is the left shoe, that will be on the left of the books with the book binding facing out. 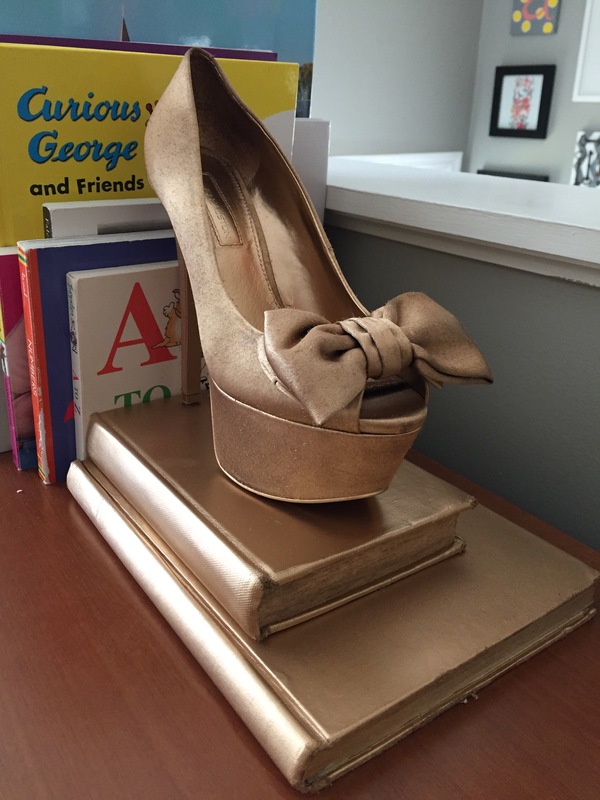 Below is the right shoe, facing so the heel can hold up books when it sits to the right of the books. Does that make sense? Typing it out just isn’t the same as saying it. Ya know? As far as spray painting shoes goes… it is pretty labor intensive. I also was careful no to over spray because the fabric of the shoe was soaking up some of the paint quickly in spots. The shape of the shoe itself was the challenge. Lots of nooks and crannies, inside and outside of the shoe and under and around the heel. I spent a bout a half hour on spray painting so all in all it wasn’t too bad. What do you think? I love how these turned out! Any quirky objects could work… a pair of mismatched clocks, piggy banks, mason jars, action figures or plastic dinosaurs for kids’ rooms. The possibilities really are endless! Let’s be honest- what isn’t inspired by pinterest anymore? 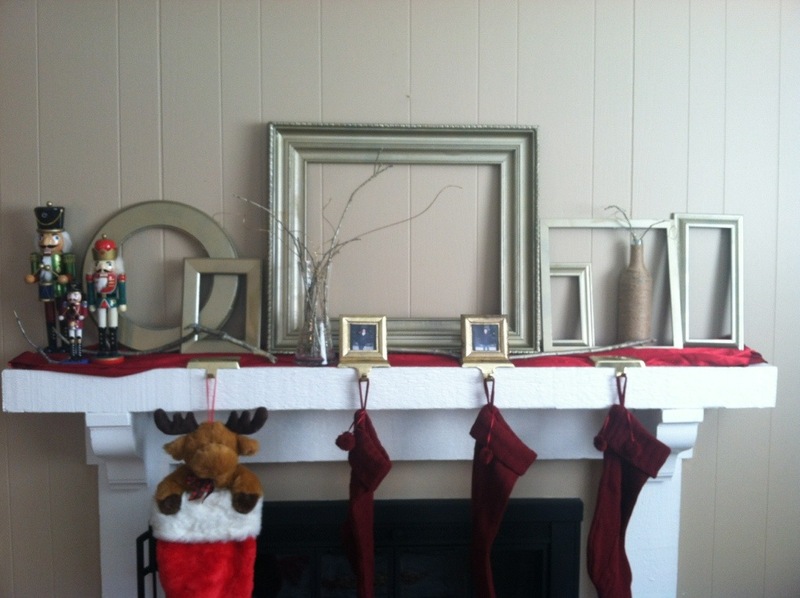 I recently got inspired to transform my ho-hum mantle into a holiday masterpiece. 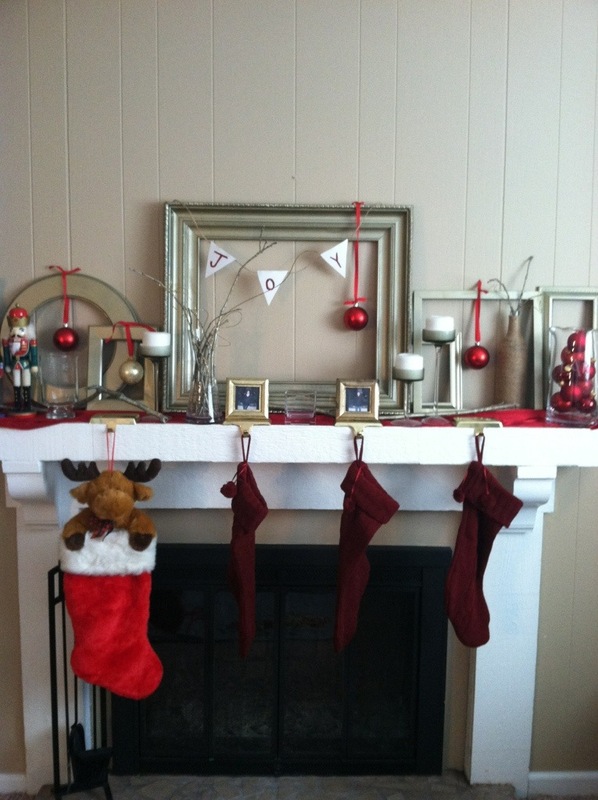 Check out my Holiday Mantle inspirations here. First order of business: color scheme. 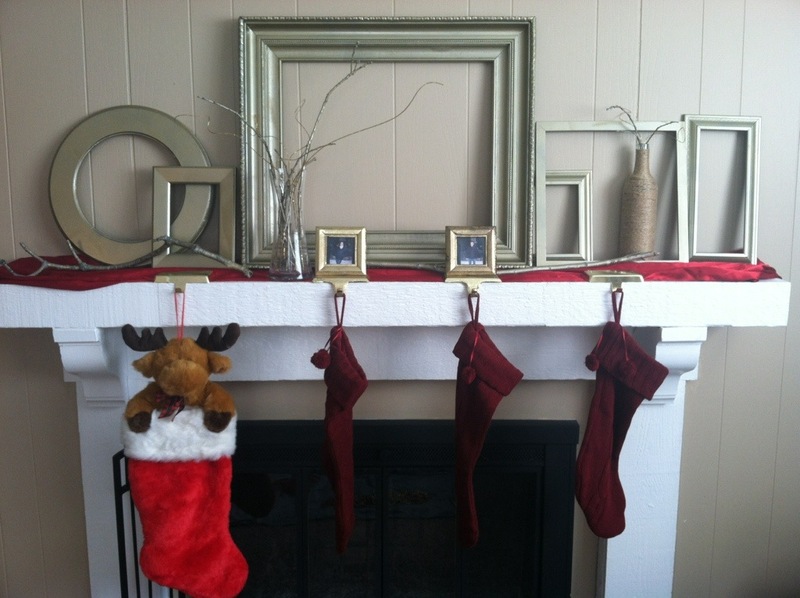 I chose a red and gold vibe… since my husband got to choose our tree decor this year (mine would have undoubtedly been red and gold)… ant it would coexist nicely with the tan wall and modest white mantle. I always believe in using what you have – I gathered up a few things. 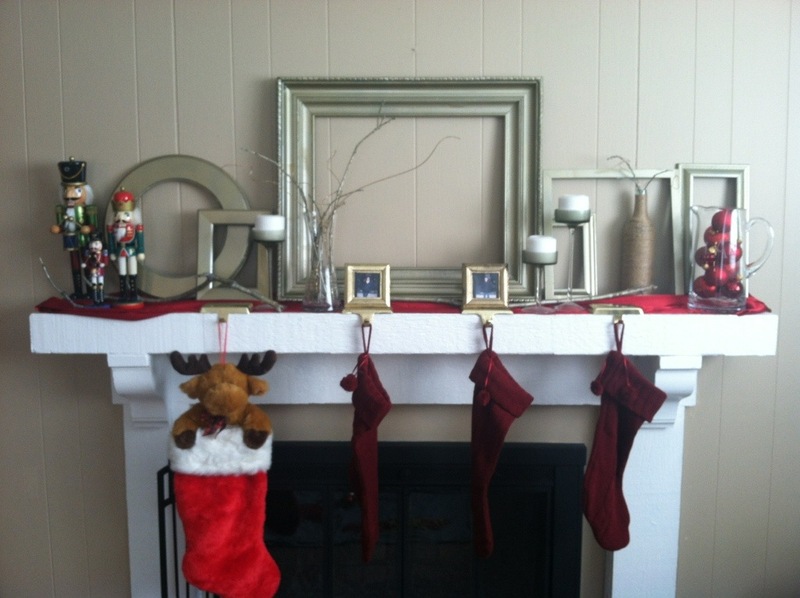 First I grabbed a few things that traditionally go on our mantle: stocking holders, stockings, etc. 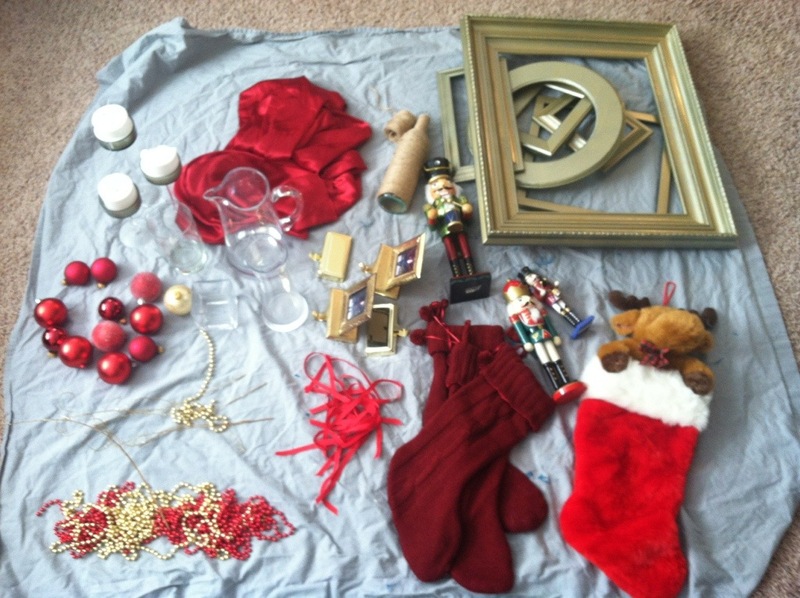 Then I gathered anything that touched on the red and gold thing I was going for. This included a hodge-podge of items pictured below. The only thing I bought for this project was gold spray paint (for the frames and twigs)… and a little bit of twine that I stumbled upon on my way out of the hardware store for a buck. So this is literally a $6 project for me. Think about your mantle in layers so that you don’t throw a bunch of stuff on it and spend all day balancing and removing items. Layer one is the red satin tree skirt. 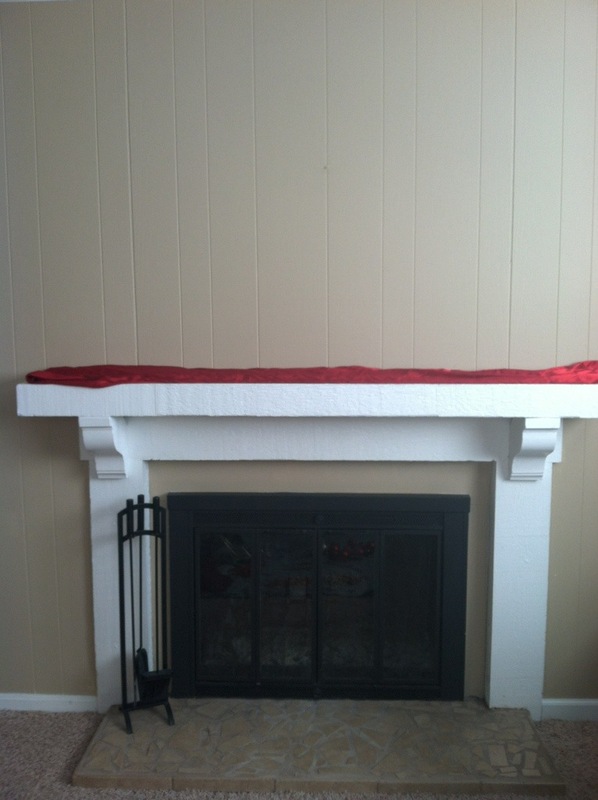 I bunched it up and folded it to fit the mantle. Other ideas for a first layer could be evergreen garland, a boa -wouldn’t a white one give a cool snow effect? !- any fabric, brown craft paper, mirrors to reflect a little light…. the list goes on. Try anything! Layer two is where I added my frames. This layer serves as the back ground so you can add anything. 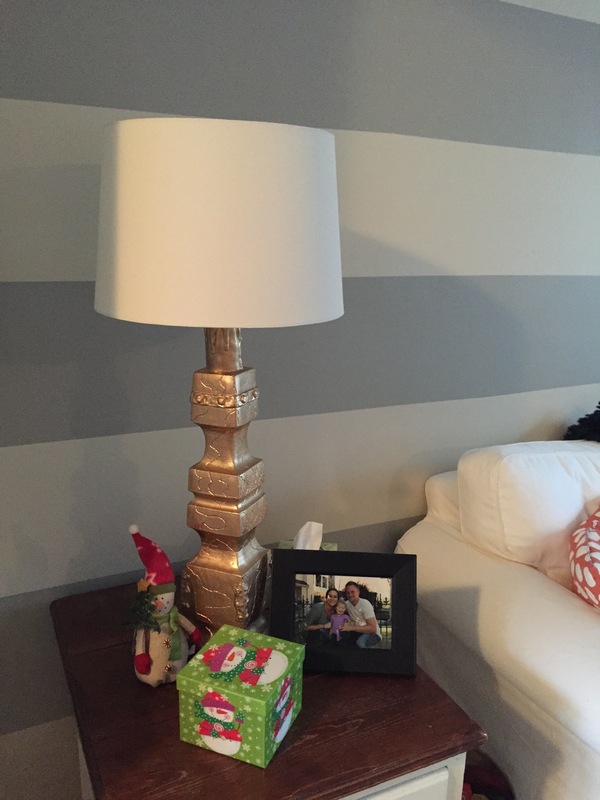 Mirrors, faux trees, lights, family photos, holiday pictures, anything you can imagine! 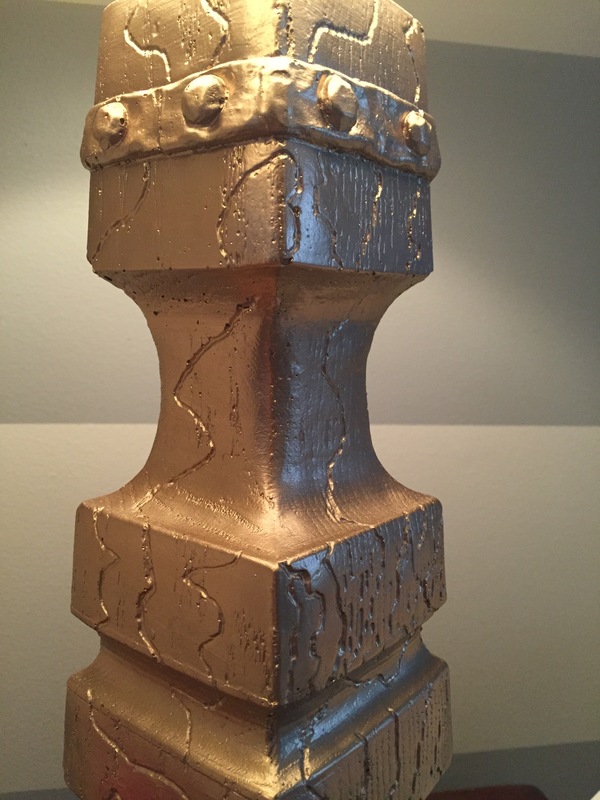 I also threw on a couple of the large sticks that I spray painted gold … I guess they are technically part of layer one. Layer three is to add height. 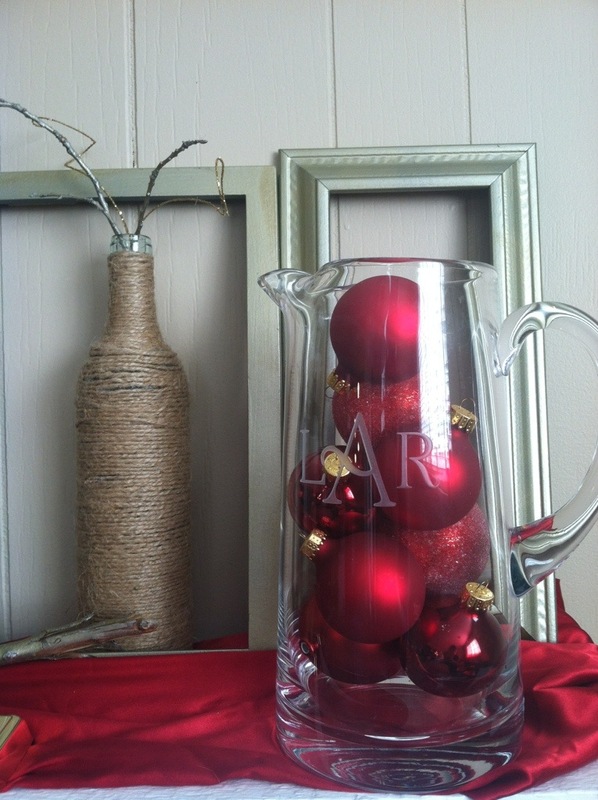 I used a tall thin vase and the twine wrapped bottle. 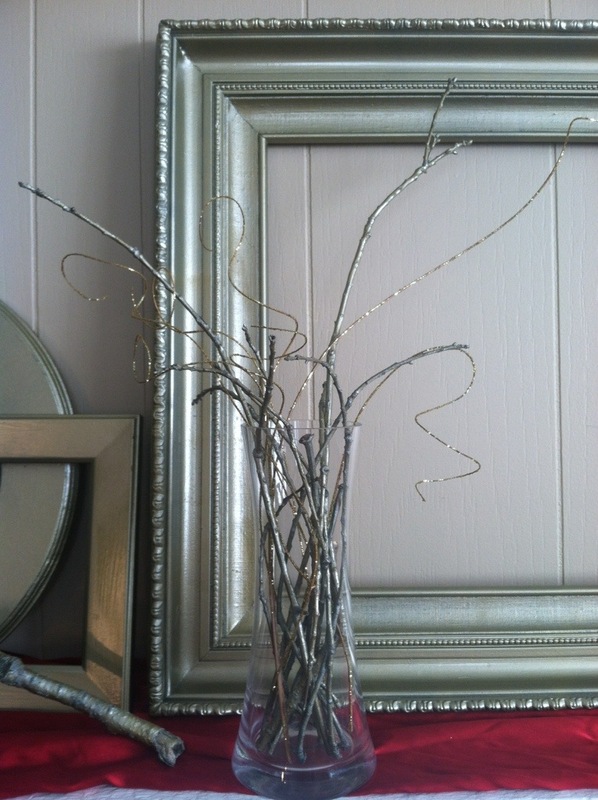 I added some gold twigs and a few gold glitter sticks. 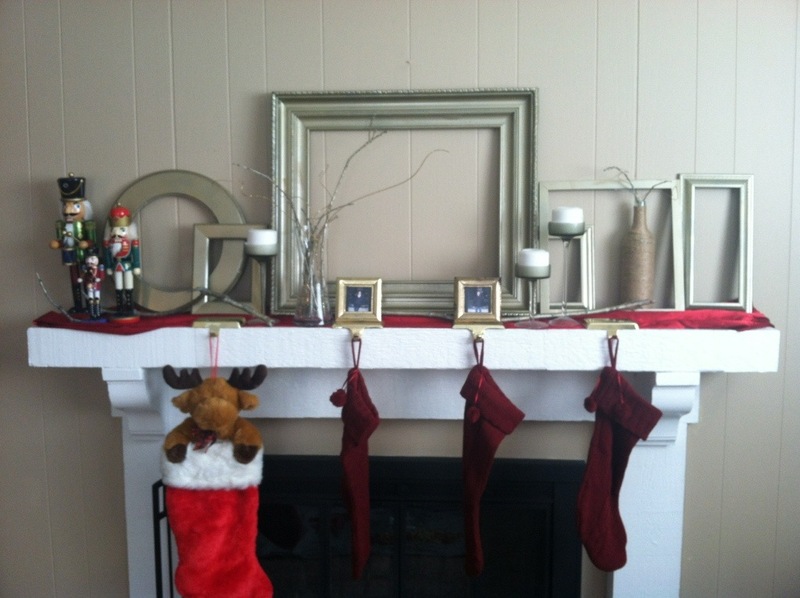 With the fourth layer I sort of skipped to the front of the mantle to hang the stockings. I knew I should add them while I could still make them symmetrical and not have to move much to do so. 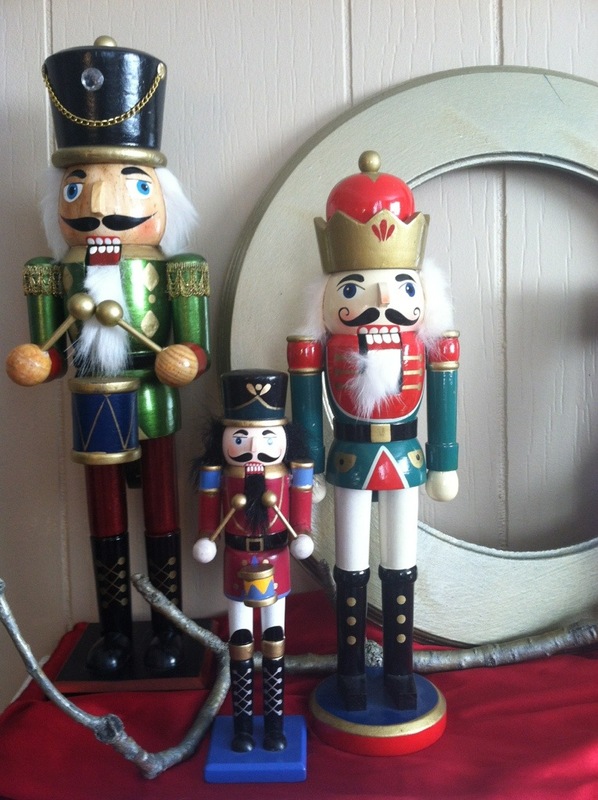 Then I started layering in a little more height and personality with these nutcrackers. A little off the color scheme but still fit if you ask me. 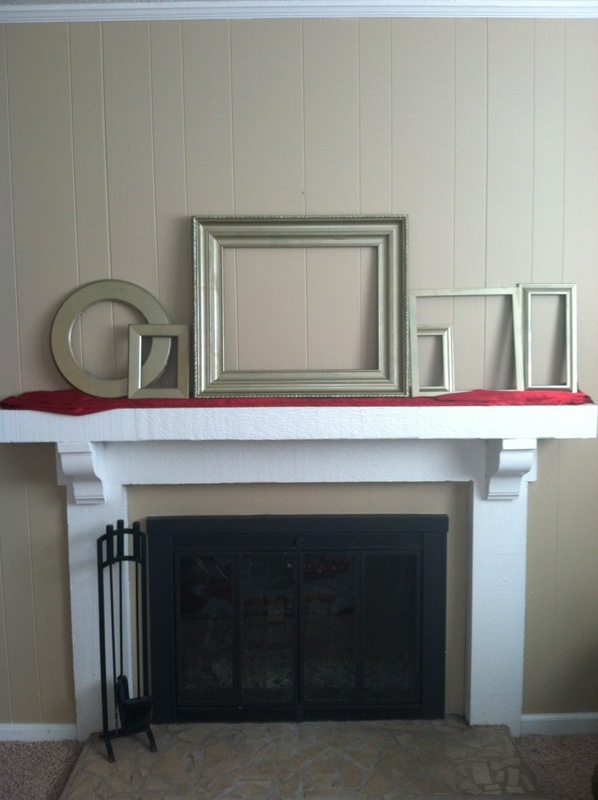 With the excess ornaments, I tied them to some of the frames so they could “hang” and give a few more pops of red. 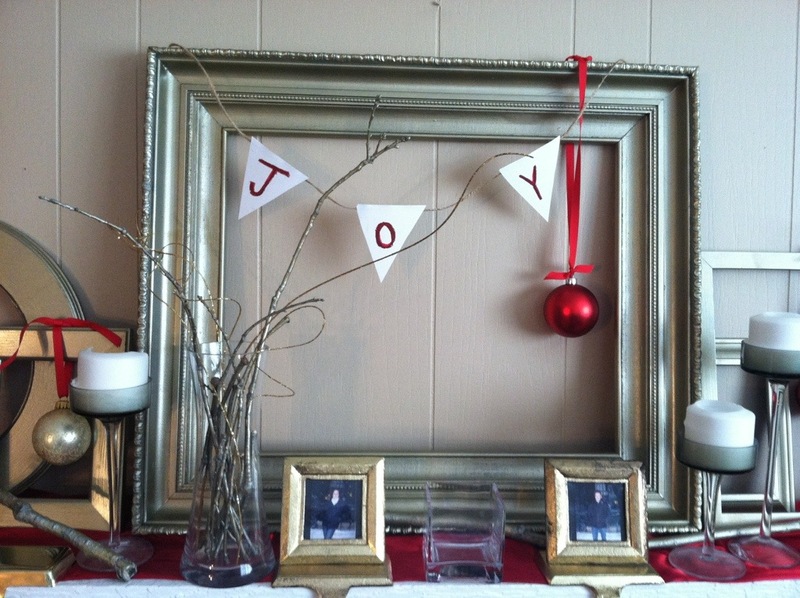 I also made “JOY” garland from a little bit of twine and paper. 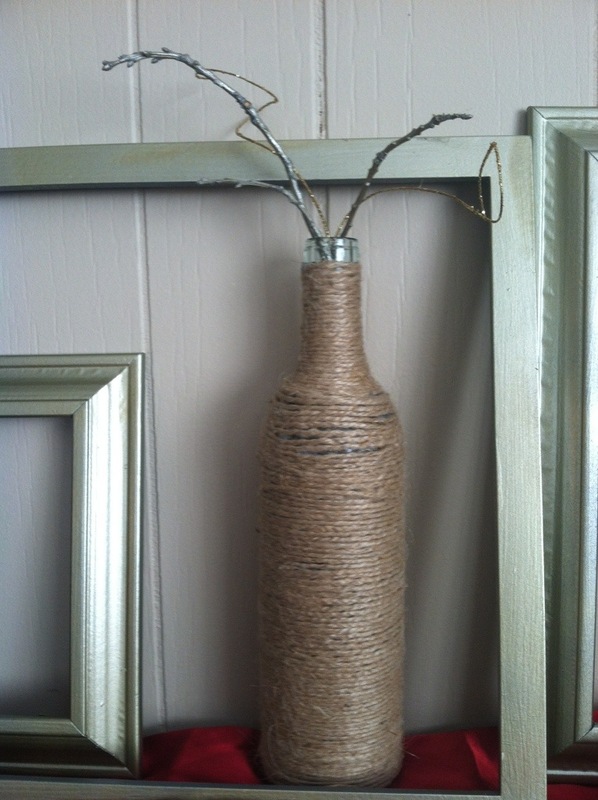 Tutorial coming soon on that and the twine wrapped bottle. There are a couple of empty vases that I plan on adding cranberries to after my next grocery trip. But all in all, that was pretty cheap and easy!